The impairments of a child with Cerebral Palsy often lead to a lack of movement and a reduced neural drive in the sensorimotor pathways which in turn can negatively impact skill acquisition and the development of neural circuits . From an ICF perspective, it is possible to say that Cerebral Palsy impacts a person’s functioning (incl. body structures), body functions (e.g. intellectual), activities (e.g. walking) and participation (e.g. playing sport) which in turn may cause ‘disabilities’ such as impairments, activity limitations and participation restrictions. Moreover, each person with Cerebral Palsy lives within a personalized environment and thus their context also contributes to determining their independence, comprising personal factors and environmental factors . Therapeutic interventions aim at motivating movement and development of neural circuits to make most of a child’s development by improving impairments, minimizing activity limitations and stimulate participation. In the past, orthopaedic surgery and movement normalization were the cores of intervention, but more recently localized anti-spasticity medication and interventions aimed at motor learning have gained a larger evidence base and have become standard practice. Although children with Cerebral Palsy form a very heterogeneous group, it seems that motor interventions with the largest effects contain the common themes of child-initiated movement, environment modification/enrichment and task-specific training . ‘Top-down’ motor approaches have become more recommended with interventions that focus on specific task training in activities of interest and are even not necessarily concerned with underlying impairments in body structures and function  . The role of a healthcare provider should be to design services that are based on the goals set by families and to act as an honest information resource to the family by providing individualized treatment and an open disclosure about prognosis. A gap between recommendations and clinical practice still exists with considerable attention still directed to changing aspects of the child (i.e., body functions and structure) although evidence encourages a more activity-based ecological intervention focus . The traditional focus on redressing physical impairments has led to many healthcare systems mainly supporting interventions at the impairment level. With a philosophical shift towards improving participation, activity and environment as an end goal, interventions aimed at these levels are becoming increasingly more important. This page will outline the current state of evidence for Cerebral Palsy interventions and then briefly introduce those approaches aiming at improved activity and body function that are recognized to be most effective. It has been reported that 30-40% of interventions that are commonly used have no reported evidence base and another 20% of interventions provided are ineffectual, unnecessary or even harmful . An overview of current therapeutic approaches for CP is presented in Figure 1 organized by outcome and categorized according to recommendation ‘do it’; ‘probably do it’; probably don’t do it’ and ‘don’t do it’. 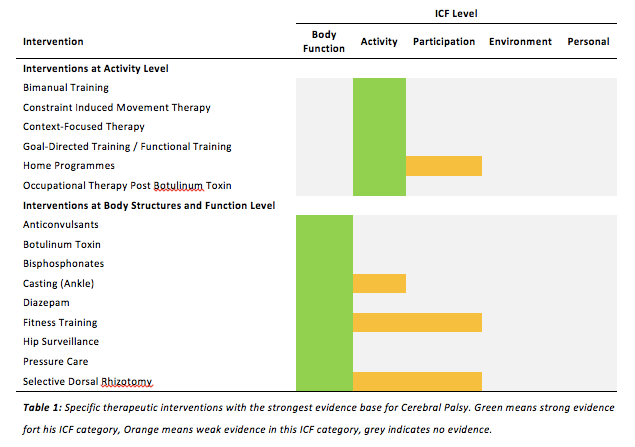 Figure 1: State of the evidence for Cerebral Palsy interventions by outcomes. The size of the circle correlates with the volume of published evidence, the colours relate to the traffic light action with the recommendations ‘do it’; ‘probably do it’; probably don’t do it’ and ‘don’t do it’. ES=Electrical Stimulation; SEMLS=Single Event Multilevel Surgery; EI=Early Intervention; NDT=Neurodevelopmental Treatment; SI=Sensory Integration; SDR=Selective Dorsal Rhizotomy; ITB=Intrathecal Baclofen; CIMT=Constraint Induced Movement Therapy; AAC=Augmented & Alternative Communication; CBT=Cognitive Behaviour Therapy. Adapted from Novak, I., Mcintyre, S., Morgan, C., Campbell, L., Dark, L., Morton, N., ... & Goldsmith, S. (2013). A systematic review of interventions for children with cerebral palsy: state of the evidence. Developmental Medicine & Child Neurology, 55(10), 885-910. Unfortunately strong evidence only exists for interventions aimed at the ICF body functions or activity levels and there are no interventions with a very strong evidence base for addressing participation, environment or personal factors even though these tend to be philosophical priorities. It also seems that positive effects at function levels don’t necessarily translate ‘upstream’ to activities or participation. On the other hand, neither do the effects at the activity level translate ‘downstream’ to body structures and function levels . Occupational Therapy, Physiotherapy and medicine are the disciplines encompassing the highest number of interventions that have been proven effective for Cerebral Palsy. Other disciplines such as psychology, speech pathology, social work and education have a smaller or inconclusive evidence base. This is possibly due to a traditional focus on body functions and impairments and a shift only recently towards environment, personal factors and participation. Nevertheless, workers from the latter group may apply evidence from other diagnostic groups (e.g. bimanual training) or from research on other populations that might be effective in Cerebral Palsy as well despite a lack of evidence. Interventions such as cognitive-behaviour therapy, early intervention, parent training and solution-focused therapy all have good quality evidence in non-Cerebral Palsy populations. Recently there has been an exponential increase in research being performed and more and more rigorous evidence is becoming available. Nevertheless, problems with a lot of published articles include low quality of designs, serious methodological flaws, poor relevance and sensitivity of outcome measures, difficulties in assembling large homogeneous samples for niche interventions. Finally, specialized equipment and assistive technology has been under-researched. The benefits tend to be easily observable (e.g. mobility), but problems such as device abandonment, false hopes and unnecessary effort remain in this field as assistive technology with a specialized appearance (robotics, suits, devices) may elevate expectations of good outcomes and give rise to an overinflated perception of high-quality expert care. Nevertheless, despite the limitations and the relatively weak clinical recommendations that can be given, the potential benefits of early motor intervention far outweigh the negligible risk of harm . In the next section of this page, the most effective interventions at activities and body functions will be briefly introduced. Table 1 is showing an overview of the most effective interventions that should be part of standard care for individuals with Cerebral Palsy. When clinicians want to help families and individuals as good as possible it is illogical to provide ineffective and possibly expensive interventions. Some interventions which were once considered to be effective have been proven ineffective and should be discontinued from Cerebral Palsy care. These interventions include craniosacral therapy, hip bracing, hyperbaric oxygen, neurodevelopmental therapy and sensory integration. Of note is specifically the ever-popular Neurodevelopmental Approach (NDT), which sought to reduce hyperreflexia by repositioning the limb on stretch providing a local pattern breaking effect mimicking spasticity reduction. It should be noted that some contemporary NDT Therapists include additional evidence-based treatment approaches under the NDT banner (e.g. family-centred approaches, motor learning etc.). However these observed local effects don’t translate in centrally driven spasticity in the long run. There is no evidence to support the idea that inhibition of primitive reflex patterns promotes motor development and similarly, ‘bottom-up’ approaches treating underlying motor deficits aiming to “prepare” them for function have disappointingly little carryover into functional activities. High-quality evidence demonstrates that casting is superior to NDT for managing contracture; botulinum toxin exists as a highly effective alternative to NDT for managing tone since NDT is ineffective for this indication; and despite less being known about whether NDT improves function, high-quality evidence indicates that functional training is superior to NDT for improving function. Consequently, there are no circumstances where any of the aims of NDT could not be achieved by a more effective treatment. Thus, on the grounds of wanting to do the best for children with Cerebral Palsy, it is hard to rationalize a continued place for traditional NDT within clinical care . These interventions in general hone a child’s strengths, reflect their interests and motivation, and ultimately seek to help children live an inclusive and contented life. Individual hands-on therapy is not always available, able to reach sufficient volume of treatment and interventions in clinical settings are less adapted to the individual context of a child and their families. Home programmes as a therapeutic strategy are therefore being used in many settings as it is consistent with family-centred approach advocated for by many clinicians. As home programmes occur in the natural environment (such as school or home), the gains that were made were more meaningful and functional. Establishing collaborative relationship between parents and therapist. Setting mutually agreed-upon family and child goals. These could include goals in terms of productivity, self-care, leisure activities, etc. Selecting therapeutic activities that focus on achieving family goals. These could include goal-directed training, parent education, handwriting task training, positive behaviour support, adaptive equipment, recreation/sports therapy, strength training, play therapy, constraint induced movement therapy, etc. Parents should be able to decide themselves the frequency that is attainable and possible for them. 18 sessions per month with average time of 15-20min per session were found to be effective after 8 weeks for motor functions of the upper limb. Bimanual training or Hand Arm Bimanual Intensive Therapy (HABIT) provides intensive training of bimanual coordination to enable practice of bimanual skills. This approach was developed in response to identified limitations of Constraint Induced Movement Therapy (CIMT) which precludes the opportunity to practice bimanual skills particularly functional activities that are inherently bimanual  . Bimanual training does not use any physical restraint allowing practicing bimanual activities typically by providing explicit instructions on how each hand should be used before practicing an activity. This approach might be difficult in younger pre-school children but for school aged children, age-appropriate fine and gross-motor bimanual activities using motor learning approaches can be used whereby the children should be actively engaged in problem solving. Improvements in hand function through CIMT can be achieved with an equally intensive bimanual approach. The latter emphasizes the importance of specificity of training for goal attainment and makes better progress towards defined goals which were usually bimanual. A recent study furthermore emphasized the need for skill training as this drives motor cortex plasticity more than unstructured practice groups . In conclusion, as most goals are bimanual, improved bimanual performance is functionally important and bimanual training allows direct practice of these goals providing similar results to CIMT. However, bimanual training allows for better progress towards goal attainment. Ideally a combination of CIMT and bimanual training should be considered when planning treatment. Constraint-induced movement therapy involves intensive targeted practice with the affected limb while restraining the non-affected limb, which means that during task-specific practice, children with hemiplegic cerebral palsy are forced to use their affected limb. Following a neurological incident, often the affected arm and hand are not used sufficiently even if there is some functional activity present. To address this ‘Learned non-use’, the approach of CIMT was developed whereby the non-affected limb was constrained hereby forcing the affected limb to work. This forced-use therapy combined with shaping and goal-directed training is now commonly known as CIMT  . Inclusion criteria: Hemiplegic Cerebral Palsy, sometimes it is mentioned that if minimal voluntary wrist movement is present the results will be more effective. Type of constraint: there is no consensus on what type of constraint is best but approaches vary from casting to splints or fabric mitts. Given the advantages of bimanual training, the restrained arm might best be included into the therapy to assist the affected hand as most functional activities will eventually be executed bimanually. Duration of constraint: There is no consensus but 2 hours per day might be a good guideline even though some advocate that ‘more is better’ and even 6-10 hours per day is possible. Age might have to be considered and perhaps it could be hypothesized that younger children and infants will need shorter intervention durations than older school-aged children. Intervention duration: In general CIMT is applied for 6 consequent weeks and longer, ideally within the child’s natural environment (home, school, etc.) but this might be challenging. Nevertheless, there is no reason to apply CIMT only once and it could be applied multiple times throughout different stages of development as part of a lifelong plan. Contemporary treatment models consider task completion and improvement of function as the main outcome measures for rehabilitation interventions rather than remediation or normalization of movement components. This focus on functional performance has been described by various terms, inter alia ecological task analysis, functional therapy, goal-directed functional therapy, activity-focused and goal-directed, activity focused, task-oriented training, etc. Identification of motor-based tasks a child was initiating, trying to modify or showing an interest into. Identification and analysis of constraints in the task through analysis of task performance together with parents, child and therapist. The context-focused approach described above is ideally combined with goal-directed training as the combination is more effective than each component separately . Goal setting as a collaborative process between professionals and parents is often recognized as key in determining an intervention program. This is in line with contemporary theories of motor learning whereby setting meaningful goals are crucial for progressing. Nevertheless it is difficult to separate the effect of goal-setting itself with the actual treatment  . Most parents are in favour of setting clear goals which in combination with activity-focused interventions tend to show promising results. Some more information regarding collaborative goal setting is outlined in Hinchcliffe A. Chapter 6: Child, Family and Therapist Working as a Team. A combination of Botulinum Toxin injections (BoNT-A) and Occupational Therapy is more effective than occupational therapy alone in reducing impairment, improving activity level outcomes and goal achievement, but not for improving quality of life or perceived self-competence. BoNT-A alone is not effective when not combined with Occupational Therapy and should therefore not be used in isolation but in combination . When injected into muscles BoNT-A reduces muscle tightness. When used in conjunction with occupational therapy, the aim of BoNTA injections in the arms and hands is to improve movement and function in treated limbs. Improvement of hand dexterity by working on hand muscle strength, finger isolations, in-hand manipulations, arching the palm of the hand, thumb opposition and pincer grasp, etc. Teach the child to control both sides of the body at the same time, like drumming, pushing a rolling pin and pulling apart construction toys. Strengthening and stabilizing the trunk (core), shoulder and wrist muscles through exercises, such as crawling, lying on the tummy while reading, etc. For example making figure eights with streamers and throwing balls at a target to the right or left of centre. Improving hand-eye coordination through activities like drawing, stringing beads or macaroni and catching and throwing a ball. Improve the ability to understand, evaluate and interpret what’s being seen, e.g. alphabet puzzles, playing with different shapes and matching games. Improve the ability to perform activities of daily living and prepare the child to be more independent at home, at school and in the community. For Cerebral Palsy interventions at the level of body structure and functions, the primary purpose is to mitigate the natural history of cerebral palsy and prevent primary and secondary complications. A diverse group of pharmacological agents used in the treatment of epileptic seizures. Serious harm, even death, can arise from no treatment. Medication injected into overactive spastic muscles to locally block spasticity. BoNT-A injections contribute to improved walking function in combination with physiotherapy. Similarly, the use of BoNT-A for improving hand function is effective in combination with occupational therapy. Injections in the submandibular glands are effective to reduce drooling. Medication to suppress bone reabsorption to treat osteoporosis. A positive effect on improved bone mineral density is seen and there are high risks for adverse effects from no treatment. Plaster casts applied to limbs to stretch muscles for muscle lengthening and contracture reduction. Serial casting whereby casts are changed regularly is one possible approach. The gains in ankle range of motion are often small but clinically meaningful for children that need more dorsiflexion to walk. Spasticity reduction is often cited as an objective for casting, however casting should not be used with this objective as the centrally driven spasticity will not decrease following casting. Including different kinds of planned structured activities involving repeated movement resulting in energy expenditure to improve or maintain physical fitness. Fitness training should be used as part of a long-term plan to maintain the health benefits achieved and should be undertaken with the children that have sufficient motor skills to undertake aerobic training. Active and regular surveillance and treatment for hip joint integrity to prevent dislocation. Prevention of pressure ulcers via good positioning, repositioning and using suitable support surfaces. Neurosurgical procedure that selectively separates nerve roots in the spinal cord to relieve spasticity. Effective to reduce spasticity as well as to improve gait kinematics. There is some evidence for improvement in activities but this is weak and should not be the primary objective for using SDR. ↑ 1.0 1.1 1.2 1.3 Morgan, C., Darrah, J., Gordon, A. M., Harbourne, R., Spittle, A., Johnson, R., & Fetters, L. (2016). Effectiveness of motor interventions in infants with cerebral palsy: a systematic review. Developmental Medicine & Child Neurology. ↑ 6.0 6.1 Novak, I., & Cusick, A. (2006). Home programmes in paediatric occupational therapy for children with cerebral palsy: Where to start?. Australian Occupational Therapy Journal, 53(4), 251-264. ↑ Novak, I., Cusick, A., & Lannin, N. (2009). Occupational Therapy Home Programs for Cerebral Palsy: Double-blind, Randomized, Controlled Trial. Pediatrics, 124(4), e606-e614. ↑ Sakzewski, L., Ziviani, J., Abbott, D. F., Macdonell, R. A., Jackson, G. D., & Boyd, R. N. (2011). Randomized trial of constraint‐induced movement therapy and bimanual training on activity outcomes for children with congenital hemiplegia. Developmental Medicine & Child Neurology, 53(4), 313-320. ↑ Huang, H. H., Fetters, L., Hale, J., & McBride, A. (2009). Bound for success: a systematic review of constraint-induced movement therapy in children with cerebral palsy supports improved arm and hand use. Physical Therapy.